I’m not an engineer; I’m not even technical. But I work in the cloud space, and am therefore compelled to have a basic understanding of the industry in order to affect positive change. By nature, “the cloud” is an intangible, inanimate array of products and services. With the industry experiencing a boom in growth from $60 billion to $241 billion in 2020 (Forrester), it is pertinent for consumers on every part of the ladder to acknowledge and familiarize themselves with the different elements of the cloud ecosystem. As you can see, there are 3 major types of cloud services. Each have their own intended customer types, from end-user to developers and system admins. But it’s important to note that while customers may overlap between services, the service types don’t really overlap between customers. See, pending the role of a service in an organization, the end customer has a specific function in their use of that service. For example, a software developer may use a PaaS such as Google App Engine to build a product, and then SaaS like Dropbox or even IaaS (Amazon Web Services) to store those project files. But while service use cases are specific, they are rarely exclusive. The very notion of “ecosystem” has a connotation that brings all these components – SaaS, PaaS, and IaaS – together into a single cohesive unit of tools for cloud computing. While you may only pay for or subscribe to one cloud component, the company behind that piece is likely utilizing the firepower of several other services to deliver your product. For example, Netflix customers (SaaS) are actually having their content delivered by Amazon Web Services, which is the massive data storage facility run by Amazon. Kind of fun to put into perspective that Amazon has their own cloud video streaming service, right? You can see by the visualization above that each component builds on the one beneath it. Perhaps a better way to illustrate this is with the depiction below, which shows the measure of value visibility by end-users. If Netflix is the SaaS, then Microsoft Silverlight (plugin required to stream video) is the PaaS, and AWS (for hosting the files) is the IaaS. The cloud ecosystem has been fully engaged, while the end-user is simply delivered content. That’s all for now, but check back monthly for more posts on the debunking of cloud mystique. Two points of clarification might help this article better address its intended audience. 1. 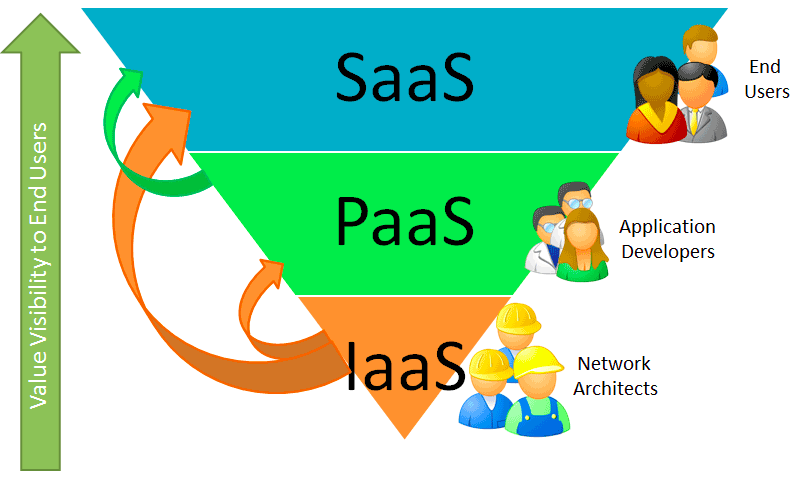 The acronyms for Software as a Service (SaaS), Platform as a Service (PaaS) and Infrastructure as a Service (IaaS) should be defined up front. 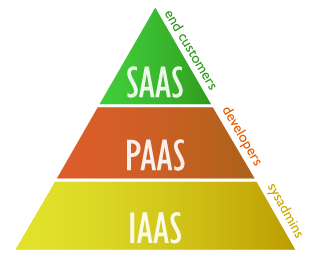 The SaaS is the most likely layer an end user or consumer will access. This is the actual application, such as a web-based word processor, e-mail, planner, bulletin board, etc. Examples: YouTube, Basecamp, Twitter. Application developers will most likely use a PaaS to develop and host their SaaS. For instance, Heroku provides an entire application environment for developers and runs thousands of SaaS. The PaaS bridges the gap between the IaaS and the application developer so that the developer can focus on their application and need not worry about the configuration of that application environment (other than the configuration of their own application itself), as the PaaS takes care of it for them. I disagree that the Silverlight plugin is a PaaS, as it does not actually provide “the capability … to deploy onto the cloud infrastructure consumer-created or acquired applications …” If anything, it’s a plugin that extends the functionality of the Netflix SaaS, as it provides functionality on the consumer’s computer (the client) but does not provide any services in the cloud in and of itself, as it does not require its own server separate from a web server. And the IaaS of Netflix appears to be Amazon S3. For example, Heroku runs on top of Amazon Web Services. Advanced developers who want to create their own PaaS or advanced applications that would be best served by the ability to customize the entire environment would be good candidates for using the IaaS directly, as opposed to a PaaS such as Heroku. In conclusion, acronyms should always be defined in articles intended for non-technical audiences, and the separations and relationships of the three layers, and the intended users of each, should be made clear. Thanks Tom! Will be making changes to the article soon to reflect some of your great points.